These meatballs prove that doesn’t have to be the case. Three servings of vegetables, plus lean protein, from kitchen to table in about 30 minutes. First, the time. I try to cook or prep as much food as I can over the weekend. I am really good at coming up with excuses during the week, and I’m especially likely to talk myself out of cooking something that takes more than 30 minutes. My timesavers for this recipe: I roasted and shredded a spaghetti squash Sunday, and I bought jarred spaghetti sauce. I like homemade sauce, but this saved a lot of time for not a lot of money. Second, the cost. Here’s a breakout of what I spent (realizing that prices vary by market and brand, and season). If you’re looking to cook healthier without breaking the bank, make friends with the frozen food aisle — specifically, frozen vegetables. It’s not unusual to find any number of vegetable varieties on sale for $1 per bag. Unlike canned vegetables, frozen retain their nutritional value. A small amount of cheese adds flavor, as do inexpensive dried seasonings. Coat a broiling pan or a foil-lined baking sheet with cooking spray. Adjust oven rack to the top one-third. Combine all ingredients except olive oil in a large bowl. Shape into 12-15 meatballs and arrange on broiling pan. Brush with olive oil. Broil 15-20 minutes until cooked through. 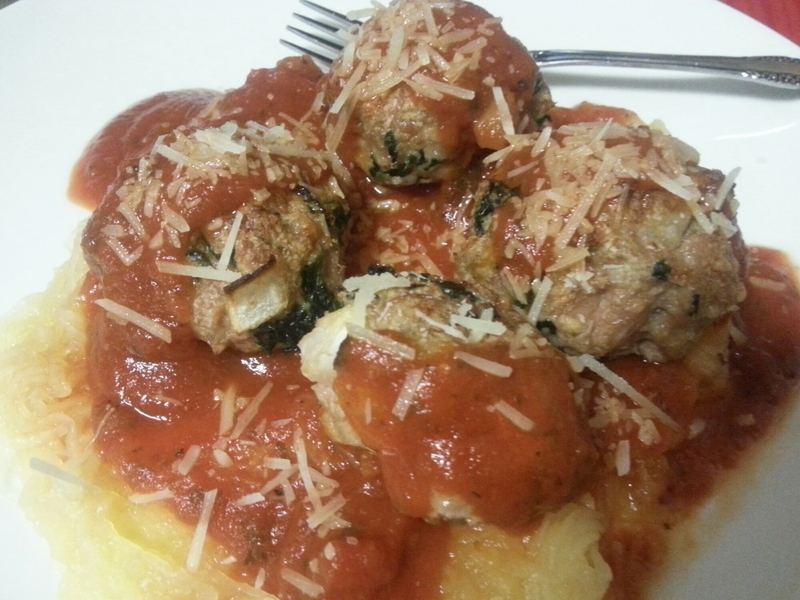 Serve meatballs with spaghetti squash and marinara sauce. Top with additional cheese if desired.